A real estate search portal built by the U.S.’s largest brokerage, NRT LLC, to compete with Zillow, Trulia and realtor.com and generate more online leads is now live in 14 of the brokerage’s 40 markets. HomesForSale.com serves up listings sourced from multiple listing services and features automated home valuations, sold data and other features more often found on third-party portals. It will be live in all of NRT’s markets by the middle of this year. NRT, the brokerage wing of real estate franchising giant Realogy, has over 42,000 agents and operates more than 700 offices in the U.S. under the Coldwell Banker Real Estate, ERA Real Estate and Sotheby’s International Realty brands. It also owns and operates Citi Habitats, The Corcoran Group and ZipRealty. 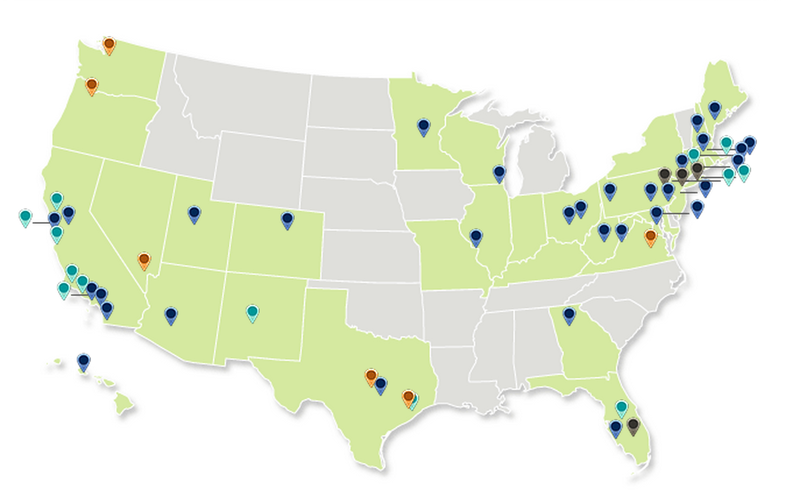 NRT’s brokerages are spread across the U.S. in more than 40 major metros. Source: NRT LLC. That statement is a jab at sites like Zillow and Trulia, which, as third-party sites, don’t get all of their listings from MLSs and which therefore have incomplete databases in some markets. As a brokerage, NRT can display other brokers’ listings on HomesForSale.com under the terms of Internet data exchange (IDX) agreements in individual markets. The site also touts the absence of display ads and ads for buyer’s agents commonly found on third-party websites. HomesForSale.com does provide home value estimates — a capability that irks some brokers and agents when it’s offered next to listings by third-party portals like Zillow. But consumers have to go to a specific section of HomesForSale.com and enter an address to see a home value estimate. Property detail pages on the site also features information on schools, neighborhoods, local demographics, commuting and nearby recently sold homes. Property detail pages feature a suite of information about homes and neighborhoods typically found on third-party sites like Zillow and Trulia. NRT agents will pay their brokerage a referral fee when leads generated by the site result in closed deals. Some brokerages that operate national search portals powered by MLS data — including Redfin, Compass and Movoto — will also provide leads to agents at other companies on a referral fee basis. The site represents a shift in NRT’s business to a focus on lead generation, Realogy Chief Financial Officer Anthony Hull told analysts on an earnings call the firm held this morning to discuss its 2014 and fourth-quarter earnings. HomesForSale.com will help NRT generate more online leads and grow revenue without raising commission splits with its agents, which will help with agent retention, Hull said. By shifting the business to “lead-generated business that has better economics,” the firm will be able to keep top agents by keeping splits low, he said. That goal is also aided by NRT and Realogy’s strategy with ZipRealty, the tech-focused brokerage with Zap, an all-in-one lead generation and customer relationship management platform, that Realogy acquired in July for $166 million, Hull added. As NRT’s CEO Bruce Zipf explained then, NRT can collect a referral fee of 35 percent on deals it sends its agents from its lead-gen efforts. In those cases, the firm also collects a commission split after that referral fee is taken off the top. Leads generated by HomesForSale.com would be scrubbed through one of three regional call centers and passed on to a subset of NRT agents trained to handle Internet leads known as “e-agents,” Zipf explained in May. Realogy spokesman Mark Panus confirmed that HomesForSale.com is in fact the “Project Flanker” site the firm introduced to investors in May, but wouldn’t answer any questions about it, like how NRT or Realogy plans to market it to consumers. “HomesForSale.com is part of NRT’s broader lead generation strategy to cast a wider net and reach more consumers via organic search,” Panus told Inman. San Francisco, San Diego and Dallas make up three of the site’s 14 active locations, but it’s not clear now how consumers are supposed to find the site. A search on Google for “San Francisco homes for sale,” for example, failed to turn up HomesForSale.com on the search engine’s first five pages. While HomesForSale.com will compete with third-party search portals like Zillow, Trulia and realtor.com for traffic, Realogy CEO Richard Smith has said the company does not expect it to attract the same amount of attention. Editor’s note: This story has been updated with comments by Realogy CEO Richard Smith about the firm’s positioning of HomesForSale.com.